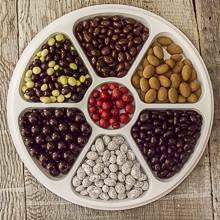 Try this great variety of our delicious chocolates which include: Tuxedo Beans, Dark Chocolate Covered Caramels with a hint of Sea Salt, Chocolate Toffee Pistachios, Dark Chocolate Raisins, Almond Truffles, Milk Chocolate Raisins and Chocolate Raspberries. Packaged in a 34 oz. round.